Aquaborne polyurethane primer that is highly effective as an adhesion promoter to metal surfaces. Effective over ferrous and non-ferrous metals, together with many plastics and mineral composites. POLAPRIME DTM is an aquaborne polyurethane primer that is highly effective as an adhesion promoter to metal surfaces. It is effective over ferrous and non-ferrous metals, together with many plastics and mineral composites. Polaprime DTM wets out the surface efficiently and penetrates pinholes and crevices to stabilize the surface and improve adhesion. The protection that Polaprime DTM provides at the adhesion interface between the coating and the substrate prevents interstitial creep and maintains a stain resistant barrier. High-strength adhesion to both ferrous and non-ferrous metals, including steel, tin, aluminum, zinc, and copper. Surfaces must be free from dirt, loose debris, oil, grease, or other substances that would interfere with proper contact with the surface. Smooth, glossy surfaces should be roughened, scratched, or abraded to a dull matt appearance. Although some dampness is tolerable, the surface should be substantially dry, and dewpoint must be 5˚ below application temperature. Weld splatter, burrs, and sharp edges should be ground away. Stir thoroughly for 3 minutes, then keep the container covered whenever possible to prevent contamination. Apply by spray, roller, or brush. Chip brushes are adequate to achieve good transfer. 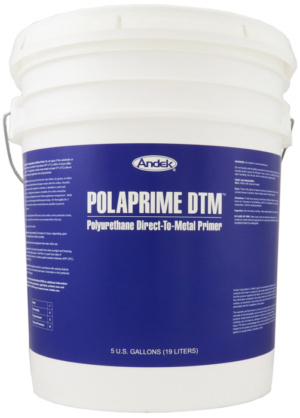 Use only enough Polaprime DTM to wet out the surface and to penetrate cracks, pinholes, etc. Spread out and remove runs and pools before they dry. As soon as the Polaprime DTM has dried to the point that it cannot be scratched off by thumbnail or wooden stick, it may be coated. This will take around 30 minutes to 2 hours, depending upon surface temperature and relative humidity. Although it is best to apply coating to the primer as soon as it has adequately dried, Polaprime DTM may be coated after many days following application. If dirt and debris has collected on the surface, this must be removed before coating. If the surface becomes contaminated with any substance that could interfere with adhesion or cause staining, then thorough cleaning and re-priming will be necessary. Approximately 90 minutes at 70°F and 70% RH. Clean tools and equipment with water while wet. Do not apply Polaprime DTM if the temperature is predicted to drop below 45˚F (7˚C) within 2 hours of completion of application. Do not apply if rain is forecast within 4 hours of application.